Fallon’s accomplished debut short story collection offers a glimpse into a world few civilians will ever experience: Fort Hood, TX. Fort Hood is a place where husbands and fathers pack their gear and leave for deployments of a year or longer. Left behind are the families, and each of the eight stories describes a different spouse or family coping with such a prolonged absence. The wife and mother with breast cancer, the teenage bride, the young mother, the Serbian wife who speaks little English—each deals with the stress and loneliness of her husband’s deployment to Iraq or Afghanistan in her own way. Some isolate themselves, choosing to live off base or move back in with their families. Others embrace the company and support of other army wives and attend Family Readiness Group meetings. This might be a work of fiction, but Fallon’s work is remarkably real, and each story’s characters immediately grip the reader. VERDICT Excellent; even readers who do not usually read short stories should seek out this book. "In an accomplished debut story collection, Fallon lays bare the lonely lives of military families when the men go to war. In these eight loosely connected tales, the families of Fort Hood, Texas, wait for their men to come home. That waiting, filled with anxiety, boredom and sometimes resentment, creates a Godot-like existence, in which real life begins only when a soldier’s deployment ends... Fallon reveals the mostly hidden world of life on base for military families, and offers a powerful, unsentimental portrait of America at war. A fresh look at the Iraq war as it plays out on the domestic front." "Siobhan Fallon's You Know When the Men Are Gone helps close the cultural gap in understanding between military families and civilians. These stories hold a mirror up to the lives of servicemembers and their spouses, and because the tales are beautifully and sensitively told, they spur conversations that Americans need to engage in. As a military spouse, I am grateful for a book that tells it like it is. As a reader, I appreciate the fine writing and keen insights. Anyone who has ever wondered how and why military families endure separations during wartime should read this important and timely book." 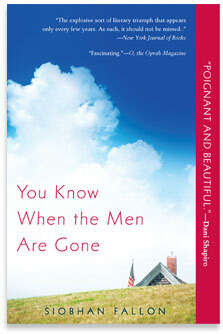 "You Know When the Men Are Gone is a stunning debut. Fallon's prose is spare and clean and beautiful, but it is her characters that will leave you breathless. They are all so alive and real, different in many ways, but strung together by a bright thread of common experience. This is a devastating book, and beautiful. Devastatingly beautiful." "Siobhan Fallon's YOU KNOW WHEN THE MEN ARE GONE is a haunting elegy to those who bear the real burden when our nation goes to war: the spouses and children left behind. She writes with the authority of hard-earned experience, and this collection of stories has much to teach us all." "What a fascinating, rare glimpse into the domesticity of war. This is a wonderful debut. Each beautifully rendered story is braced with intelligence and wisdom." A brilliant work of fiction that speaks a haunting truth on every page. This is an important work that should be embraced by the military community and beyond. In You Know When the Men Are Gone, Siobhan Fallon writes with grace and intelligence about the army wives at Fort Hood who are waiting for their men to return from Iraq. Fallon follows the lives of women with children, women with cancer, women who can't bear another night of sleeping alone between flypaper walls. Some of Fallon's women find courage in the others left behind, some take comfort in a past without war -- in their memories, their Hawaii's, their first true loves. All have a sense that real life stops the moment the men board the busses and leave Fort Hood. You Know When the Men Are Gone is a poignant debut, written with the kind of love and detailed accuracy that can only come from living behind the barbed wire at Fort Hood, as Siobhan Fallon has. You'll laugh with her characters and you'll cry with them. Like them, you'll try to add up what it's all worth. You Know When the Men Are Gone is funny, sad, wise, and essential. Turn off the news and pick up this book. You won't be disappointed.